Lower earners benefit most from global reductions in income taxes over the past two decades « UHY UZMAN Yeminli Mali Müşavirlik ve Bağımsız Denetim A.Ş. 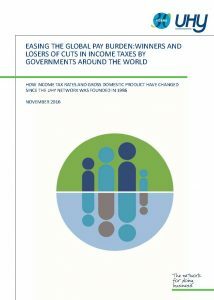 Workers on lower incomes have benefitted more than higher earners from global reductions in income taxes over the past two decades, according to a new study by UHY, the international accounting and consultancy network. 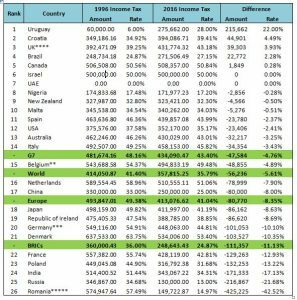 The research reveals that the average global effective income tax rate for workers earning USD30,000 has fallen at a faster rate (down 11% – from 27% in 1996 to just 16% today) than income taxes for individuals earning USD1 million (down 5.6% from 41.4% to 35.8%) in the last twenty years. The study found that on average, BRIC economies (Brazil, Russia, India, China) are cutting tax at a faster pace than G7 economies for both lower and higher earners. For those earning USD30,000 in BRIC economies, the average effective income tax rate fell by 15% (from 34% to 19%) over twenty years, compared to just 7% in the G7 (from 20% to 13%). For workers earning USD1 million, average income taxes decreased by 11% in BRICs (from 36% to 25%) and 5% in the G7 (from 41% to 36%). UHY studied tax data in 26 countries across its international network, capturing the effective income tax rate for lower and higher income workers*. India has seen the biggest cuts of any major economy for lower earners, who have seen their income tax rate fall by 28% (from 50% to 22%). Higher earners have also seen some of the most significant reductions (falling 17% from 51% to 34%). In the last ten years, the Indian taxation system has undergone significant reforms, with a number of tax rates rationalized and tax laws simplified. Lower earners in the US saw their income tax bills fall by 4% (from 18% to 14%), and just 2% in Japan (from 9% to 7%), which cut income taxes for higher earners by far more (9% – from 50% to 41%). However, President-elect Donald Trump’s tax plan looks to reduce taxes across the board, but before any proposed changes can be made, they must be approved by Congress. UHY’s data also reveals the extent of global economies’ GDP growth in the last thirty years, since the UHY network was founded in 1986. Their figures show that emerging and developing countries have grown significantly in the past thirty years – China by 1421% – far outstripping more established economies and well above the global average of 135% GDP growth (see third table below). India (577%), Malaysia (479%), Bangladesh (350%) and Nigeria (333%) were also in the top five for GDP growth over the last three decades. Overall, BRIC economies grew by 348% over the period, while the G7 grew 87%. While the BRIC figure includes Russia, which had the lowest level of growth in the study (15%), their growth rate reflects the difficulties arising from the break-up of the Soviet Union in 1991. Since 1996, the Russian economy has grown 88%. The US GDP grew by 115% while the UK saw 95% growth over the three decades. *In this study, lower earners are defined as those earning USD30,000. Higher earners are defined as those with incomes of USD1million. The calculations are based on a single, unmarried taxpayer with no children. ****For the United Kingdom, these figures exclude UK National Insurance Contributions (NIC). NIC is payable by individuals on their income earned from employments, self-employments and partnerships in addition to Income Tax. The highest rate of NIC in 2016 is 12%. GDP data from the United States Department of Agriculture. For additional information about this article please download the PDF below. Established in 1986 and based in London, UK, UHY is a network of independent audit, accounting, tax and consulting firms with offices in over 320 major business centres across more than 90 countries. Our staff members, over 7,600 strong, are proud to be part of the 16th largest international accounting and consultancy network. Each member of UHY is a legally separate and independent firm. For further information on UHY please go to www.uhy.com.